I am sure that by now you have heard about Siri, a feature on the iPhone 4S. I haven’t had a chance to try it out, but I believe that you should be able to ask Siri a question, and you’ll get an answer. Yes, the age of conversing with computers has finally come. 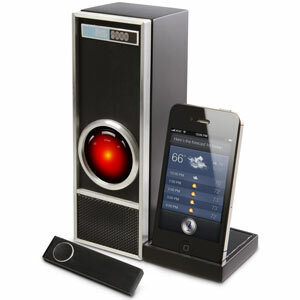 It was shown to us in films like 2001: A Space Odyssey with the HAL 9000, and is now a reality. Granted, it is the year 2011, but ten years late is better than never. If you go to ThinkGeek right now, you can check out the IRIS 9000, which allows you to use Siri from a distance. (Iris is Siri spelled backwards.) You can use the IRIS 9000 as a standard spearkerphone to make and receive calls, and an included micro remote triggers Siri with the press of a button. The IRIS 9000 has the sci-fi styling with an aluminum trim, and has the glowing LED eye that flickers with the voice of Siri. It is definitely made for the desk as it is AC powered, and the user can probably mount it on the wall like in the classic Kubrick movie. I wouldn’t suggest attaching IRIS 9000 to any other machines in your house. You don’t want to be in a situation when you ask for something to turn on and have the IRIS 9000 say “I’m afraid I can’t do that”. But that really is science fiction. The fact is the IRIS 9000 is available on ThinkGeek for a price of $59.99.